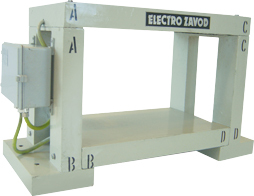 Electro Zavod Metal Detectors detect the presence of metals-both magnetic and non-magnetic in moving bulk material. Tramp Metal affects many Industries, and presents Quality Control problems or a Hazard to processing equipments i.e. Crushers, Ball Mills, Conveyor Belts, etc. Electro Zavod Metal Detectors meet the requirements of a wide spectrum of industries like Iron Ore, Metallic Ore, Cement, Coal, etc. Electro Zavod Metal Detectors with rugged design and continuous heavy- duty usage, are field proven. Electro Zavod’s R & D and continuous innovations ensure the performance and reliability of Metal Detectors. Electro Zavod Pulse Metal Detectors operate on the principle of Eddy Current induced imbalance in a set of mutually balanced coils. A frequency of 20 KHz to 100 KHz is used to generate an electromagnetic field in the aperture area. The system automatically maintains a high degree of balance which is distributed by the metal passing through the aperture resulting in a signal, which is amplified to operate an audio visual alarm and interlock or reject mechanism system. The Electro Zavod Pulse Metal Detectors works well with magnetic and conductive ores. No other system can work effectively when a tramp metal is to be detected in the presence of magnetic and conductive ores. The Electro Zavod Pulse Metal Detector detects 25mm MS sphere/cube and 25mm Al sphere/cube. Detects ferrous and non-ferrous metal including manganese steel and stainless steel. Distinguishes between stationary and moving metals. Automatic sensitivity for temperature variation and static metal. Completely solid state using latest technology, ruggedly built to give years of trouble - free operation. Easy installation: Search Coil can be installed around an endless belt. Can take supply voltage variation of 1- 15%. Suitable for ambient temperature up to 55°C and humidity 100%. Audio-Visual Alarm to draw the attention of the operator. Potential - free change over contact for interlocking as per customers requirements. Reliable Sand Bag Marker and External Hooter can be coupled to the system.